A non curable medical condition/syndrome that causes chronic musculoskeletal pain and fatigue in the muscles, tendons and ligaments. The practices of Tai Chi and Qigong are gentle ways to approach exercise when living with fibromyalgia. The movements can be adapted to the ebb and flow of each student’s health baseline, from lying down to seated and standing. Students will learn what makes the Classical Chinese movement arts both powerful and relaxing. A high importance is placed on a correctly aligned posture relating to life long physiological health. There is a difference between good and bad pain which Tai Chi and Qigong help to teach, so the students can exercise in a healthy and appropriate way. When learning the movements, students also learn about pain as an observation tool and how to pace and manage fatigue. “Hibernating Bear Tai Chi” comes from instructor Nicola‘s ethos to make authentic Tai Chi and Qigong online training available to all abilities. 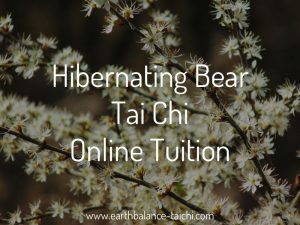 In this online lesson the content is tailored to the student, where Nicola passes on her unique insight into training the Classical Chinese arts when living with chronic and degenerative health, during injury recovery and/or living with a different baseline from the norm. Visit the Hibernating Bear lessons in the webstore. Please note that the Taoist practices are not a replacement for conventional medical treatment. Please seek advice from your GP before commencing any movement or stillness practices.